Al-Aqsa is a ‘Red Line’, Warns Sheikh – I Am Not Ashamed Of The Gospel Of Christ! My comment: I really don’t know why the world leaders and the Christian population especially don’t recognize this. 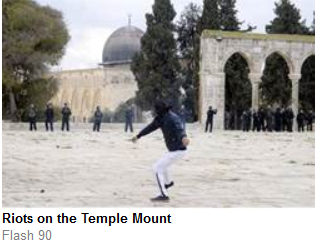 There will never be peace here, there will never be a shared arrangement on the Temple Mount as they say. This people continuously denies that Israel ever existed here. They deny Israel ever had anything to do with this. They are still to this day saying that King Solomon was a muslim, Jesus was a palestinian and on and on it goes. Yet Christians are involved in portraying this also. The one’s that aren’t are silent, and more and more are believing the lies. The Jewish people know their history, and heritage, Christians should be the next. I can’t believe they don’t. It’s mind boggling. Jesus was born to a Jewish line from King David, in a Jewish city, Bethlehem. He was raised in and around the Temple Mount, he studied there, He preached there, and brought His message of salvation there. What part of that don’t Christians and the world understand? Mohammed didn’t come from there, it’s said he tied his horse there and rode into heaven there, but really? Let’s say for a minute he did. All those prophets of old that were taken in the spirit to heaven, came back with the same message. And we are warned throughout the entire Bible of false prophets, and even given instructions on how to discern this. Yet we would still believe that a prophet who gives a totally different message than the rest of the Bible is a prophet of God above all other prophets, even Jesus. Wake up. And recognize this for what it is. False religion, false doctrine, a false god, false prophets, and most assuredly Antichrist. Read your Bible, study History. (Israel National News) “We will not give up even one grain of Al-Aqsa, since the Jews have no connection to it,” declares head of the Supreme Muslim Council. Sheikh Ikrima Sabri, the Imam of the Al-Aqsa Mosque in Jerusalem, warned Israel on Friday against “harming” the mosque. Full Article Al-Aqsa is a ‘Red Line’, Warns Sheikh – Middle East – News – Israel National News. The end-time prophesies will be fulfilled and I can barely believe how far into Revelations we are living, the Rapture is here, these are one of the many signs of Christ’s return. We can only pray for all these people now for the Lord says that which we ask in His Name shall be given us and if it’s all we ask then it is mercy for their souls.